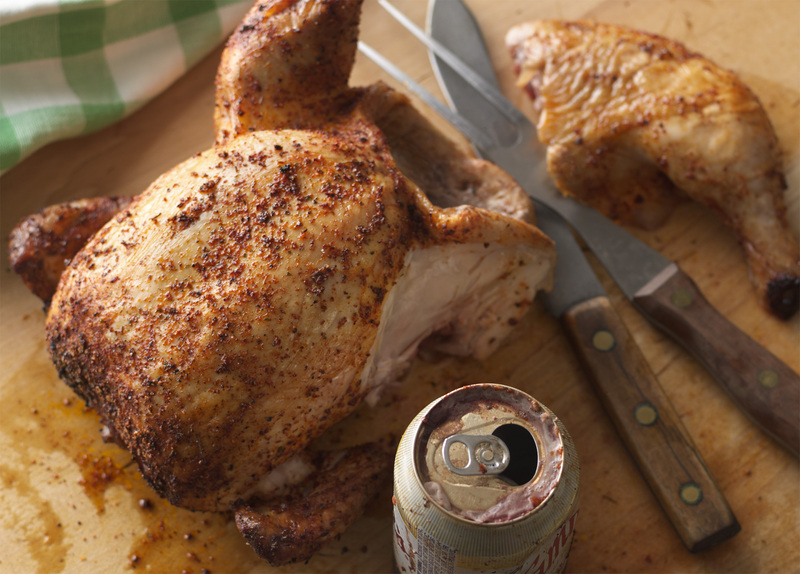 Use your favorite beer or ginger ale for this easy, oven-baked version of the popular grilled beer can chicken. Open can of beer or ginger ale; using pointed tip of bottle opener, puncture two holes in top of can. Pour 3/4 cup of beer or ginger ale out of can; drink or discard. Sprinkle 2 teaspoons barbecue-flavored seasoning into beer or ginger ale in can. Sprinkle 1 teaspoon barbecue-flavored seasoning inside chicken. Brush outside of chicken with vegetable oil; rub with remaining 1 tablespoon seasoning. Place beer or ginger ale can in 9x9-inch ungreased baking dish. Hold the chicken upright (with the opening of the body cavity at the bottom) and lower it onto the can so the can fits into the cavity. Pull chicken legs forward to form a tripod. Place in oven and bake chicken until no longer pink near bone (165°F on an instant read thermometer inserted near the thigh bone) and juices run clear, about 1 hour 5 minutes to 1 hour 15 minutes. Carefully remove chicken in pan from oven. Let chicken rest for 5 minutes, then carefully lift it off the can, using tongs and paper towels (works best with 2 people). Place chicken on a platter or carving board. Let rest for another 10 minutes before carving. Discard beer or ginger ale in can. Mesquite-flavored seasoning may be substituted for the barbecue version called for in this recipe.